Tesla Motors is an American company that designs, manufactures and sells electric vehicles. The Model S is the new sedan car which was released to the US market in June 2012 and is expected to be available to the UK market in May 2014. Tesla sold 18,000 units of the Model S to the US market in 2013, ranking Tesla’s Model S as the third top-selling electric plug-in car in the US. 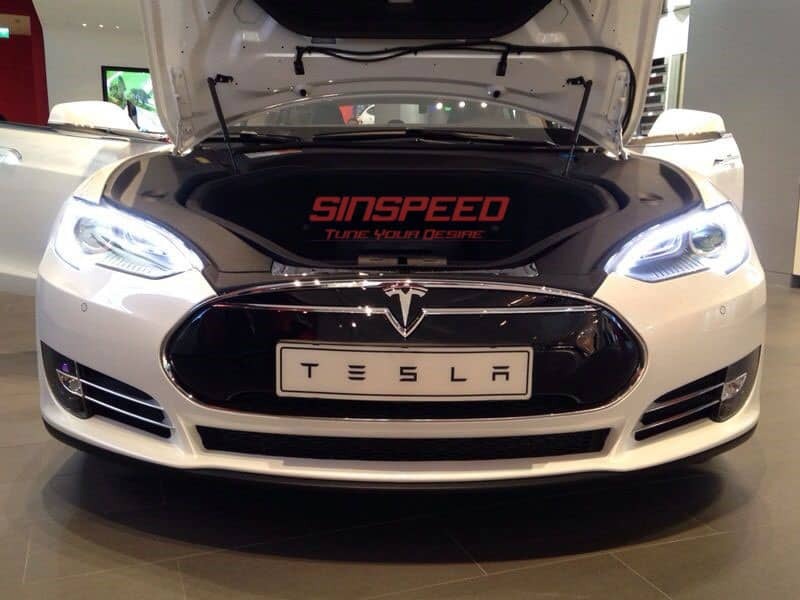 Tesla are expected to achieve 35,000 global sales during 2014, a 55% increase over sales from 2013. Yesterday we were given the opportunity to test drive the new Model S accompanied by Tesla’s product expert Suresh Nahar. When seeing the pearlescent white demo car at Tesla’s new store at Westfield London we were a little overwhelmed and a few keywords came to mind: Futuristic, Sophisticated, Mean Machine. Having a quick look around the car we soon noticed that there was in fact no engine bay and nothing for the average boy racer / petrol head to be in awe of. The bonnet was “boot space” and the boot was just a large boot with the addition of 2 rear-facing seats for children – making this sporty looking sedan a 7 seater! We went on to take a closer look.. Included in the price of the vehicle you have the option of Solid Black or Solid White paint but for an additional £600 you have the option to upgrade from Solid paint to Metallic with 5 colours to choose from: Silver, Blue, Green, Brown, Grey. If you’re looking for the wow-factor then the Tesla Multi-Coat upgrade for £1200 will give you the option of a Pearl White or Red and both look Wow! 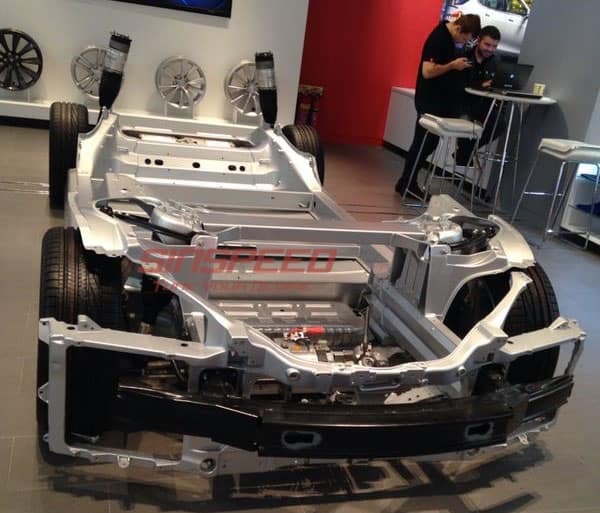 The body of the car is built from lightened Aluminium and reinforced with high-strength Steel, which would explain why it weighs over 2 tonnes. Tesla meets the European crash requirements and boasts an armoured floor which helps prevent the battery packs being damaged by road debris. However, the battery can be accessed and removed using a specialised jig in just minutes. The charging port at the driver side rear has 3 LED lights beside it to show you the charging status and the slick design of the body and flush motorised door handles which slide out to greet you gives it the look and feel of a concept car. The blanked off radiator grill at the front is probably the only thing we would want to change on the exterior. Having no engine at the front and no drivetrain gives Tesla the opportunity to maximise on interior space. We placed a rear-facing baby seat in the back (Isofix points come as standard) and were still able to recline our front seats all the way back – enough so that a 6ft tall man can sit and stretch his legs freely. You can very comfortably sit three in the back and two at the front with plenty of leg and head room. There is also 2 rear-facing child seats which fold out in the boot making this futuristic sedan a roomy 7 seater. The drivers instrument cluster is also far from conventional. There is no fuel gauge and no temperature gauge. Instead there are digital dials for your vehicle speed, range and efficiency – which shows you how much power you’re drawing from the battery and/or at what rate you’re charging the battery whilst driving. There is also a GPS map which shows your exact location which is pretty cool. Xenon Headlights – You can turn them on / off or leave them on Auto. 3G Sat-Nav – Tesla assumes you live in a good 3G connection zone and has a built in satellite navigation system using Google Maps. 10 User Profiles – So if you’re car sharing, you no longer need to sit and mess around with your seat, mirrors and steering wheel positions. You get up to 10 user profiles to store your preferred settings. USB + Bluetooth – There is NO CD player but it does have a built in USB port + Bluetooth connectivity to play music from as well as Radio and Internet Radio compatibility. Electronic Door Locks – Allows you to lock/unlock all doors right from the central screen and turn on/off the child locks. Heated Seats – The front seats come heated as standard and an optional upgrade gives you control to switch on heated rear seats for the rear as well. Regenerative Braking – This is an amazing feature which we will explore a little later in detail. Emergency Vehicle Shut-Off – In case of an emergency i.e. an accident, you can power off the vehicle. Adjustable Ride Height – This feature is available if you select the upgraded air suspension. Traction Control – I think even The STIG would be mad to turn this off in this monster. 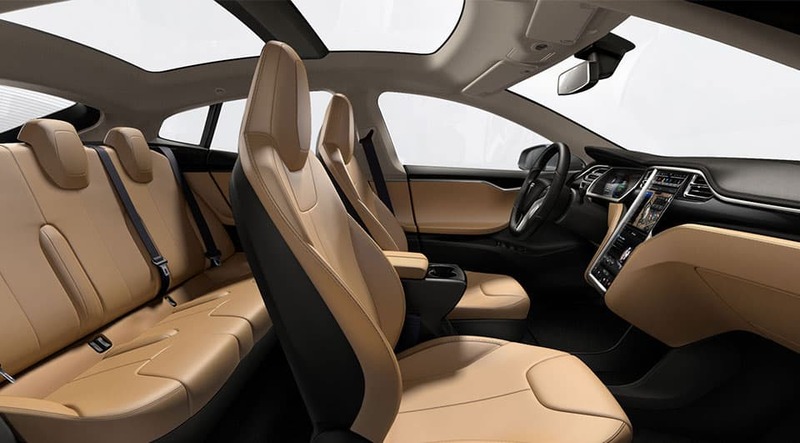 Live Diagnostics – If your vehicle develops a fault, Tesla will remotely connect to the vehicle and perform a live diagnostics over the vehicles 3G internet connection to determine the fault. Heating + Aircon – There is no waiting for the engine to reach optimum temperature, you get instant hot or cold air feeding through the vents as soon as you switch it on! The central display has the look and feel of a large iPad and a built in web browser which allows you to surf (even whilst driving! ), although for safety reasons there is no flash player so you can’t watch movies as that would be a major distraction – but I feel the large display may be a distraction in itself. The A-Post is very prominent and so a few times when wanting to turn left/right we had to lean over to make sure we could see everything. The central display is a great idea but will take some getting used to and may be a bit of a hazard when trying to navigate through the large iPad whilst driving – is that even aloud? However, main things like cruise control, indicators and flashing the headlights is controlled on the steering wheel stalks as expected. Right, where to start.. so it’s a Rear-Wheel Drive (RWD) and the performance model (P85) boasts a maximum power output of 469HP + 600Nm of torque all instantaneously available with a max speed of 130mph (electronically limited). Can you imagine having 600Nm of torque available in an instant? No waiting for a turbo to spool up or the revs to climb to build enough torque. I didn’t believe it and had to ask, really how long does it take to reach optimum power delivery and the response I got was “When you flip a switch, how long till the light bulb turns on?”. Driving around town the Tesla is very comfortable and the model we drove didn’t have air suspension but even in the back it went over humps really well. On a private road, from standstill we floored the accelerator pedal and my reaction?… My God! I’ve driven many cars over the years, a remapped Ford Focus ST, 500hp Nissan Pulsar and the new Aston Martin Raipide but NOTHING has come close to the feeling you get from flooring the Tesla Model S P85! – We had almost no wheel spin thanks to the wider rear staggered tyres and the power delivery was so controlled, you really have to trust the P85 to do it’s business – and it does it well! Regenerative Braking – This feature is so cool and I don’t think it’s been emphasised enough. Driving around town there is a lot of stop/start especially in London and conventionally would be bad for our vehicles economy and increased wear of braking components i.e. brake pads + discs. Without getting too technical on how Regenerative Braking works. Having this feature on whilst driving allows us to adopt the “one-pedal driving” technique described by Suresh Nahar. When you release your foot off the accelerator pedal, the motor produces more friction which slows the vehicle down without using the braking system and at the same time uses the kinetic energy to recharge the battery. If using this feature correctly, you can be recharging your battery in stop/start traffic and increase the life expectancy of your brake pads + discs. It does take a little getting used to, you have to learn to trust the system to brake for you – and it does! Pressing the brake pedal with regenerative braking system active will still allow your brakes to work as normal. At the front of the chassis you have what looks like the new Bosch 9.0 ABS / ESP pump and module which takes care of the traction control and the advanced braking system and also the Electric Steering Rack + Motor means there is no steering pump or fluid. The low centre of gravity and even weight distribution allows this RWD to handle really well. The vehicle is powered by a rear mounted single motor with only one moving part (the Rotor). This is connected directly to the single-gear driven gearbox. That’s right.. single gear – no loss of power between gear changes. It is one gear which does forward driving from standstill to 130 mph and the same gear is used for reverse. From the gearbox are two driveshafts which connect to the back wheels to deliver the power and that’s it! 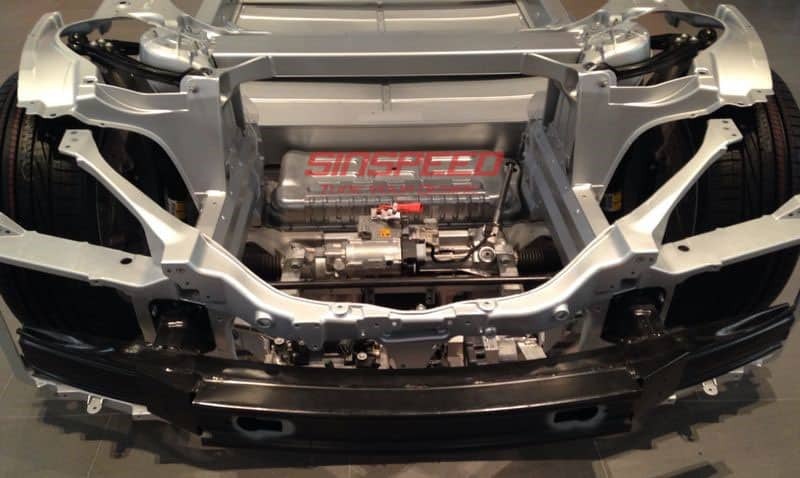 Because there is no engine, no drivetrain, no exhaust and no coolant system – there is much more space to fit all mechanical parts more spaciously. 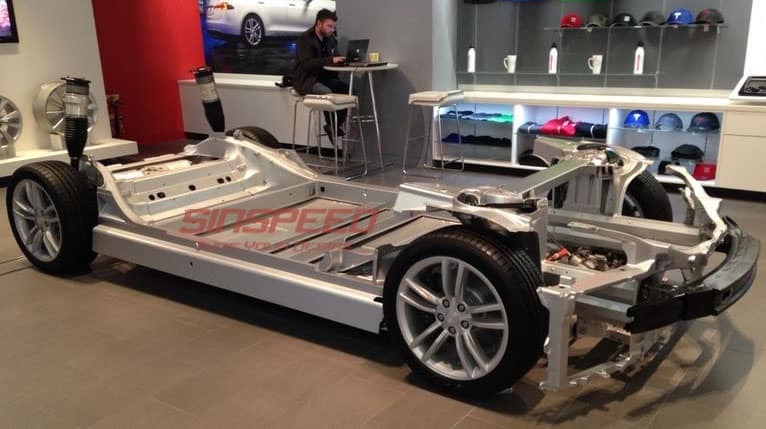 This means everything is much more accessible and speaking to Suresh and the others at Tesla we’re told the Electric Motor (engine) can be removed in under 30 minutes and the single gear driven gearbox can be removed in just 10 minutes by a single technician. 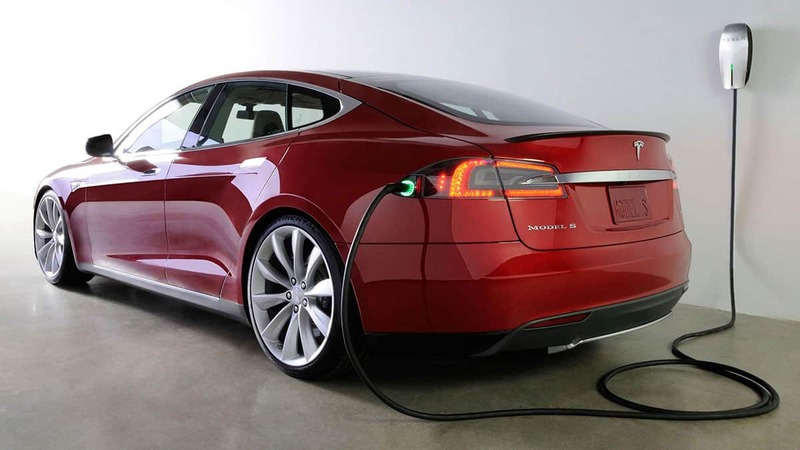 Charging the Model S is very easy, just plug it in to your mains power supply. There are various adaptors available and depending on the power outlet you can charge in as little as 4 hours. Tesla are rolling out a Supercharging station (just for Tesla’s) and for the £1200 upgrade (included free in the 85kw and P85) it’s well worth it. It means you will be able to use the facilities at the Tesla Supercharge station when they become available in the UK (expected end of 2014). Tesla Supercharge stations will be completely free to use and charge your Tesla electric vehicle and can fully charge a P85 Model S in just 30-40 minutes using lightening speed charging ports delivering 120kW/hr! There are currently 16 Supercharge points in Europe but there are plans for many more including London and Birmingham this year. The battery can take up to 15 hours to fully charge but depending on the power outlet it can be charged in much less time, between 4 – 9 hours. If something does go wrong, it will most definitely be electronic and could cause shortages and other problems. From experience we know electronic parts are not cheap to change but with live diagnostics, dealer-coded electronic parts and near enough no mechanical components.. what’s the fate for mechanics? Future technicians carrying out repairs in Boss suits? – not worried about oil leaks or exhaust soot getting their hands dirty. Let us know your thoughts. For more information on this car, checkout the Tesla Motors website. 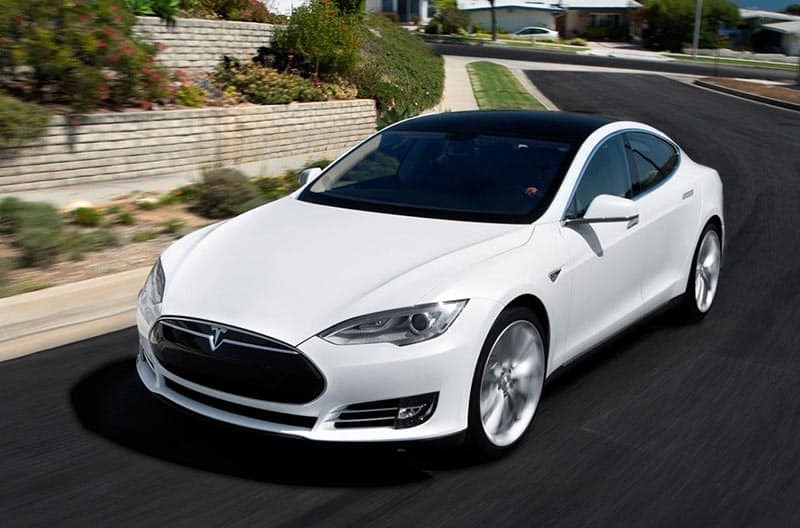 Tags : Tesla Model S Electric Car, Tesla Model S P85, Tesla Model S Review, Tesla Model S Test Drive. I think this car will definitely raise the bar on other manufacturers to up their game and get with the times. Fossil fuels are old school and the sooner they realise it, the better for all of us! @Mike the electric car was invented before the fossil fuel car!